Read-Along Producer: Ted Kryczko. Writer: Jamie Simons. Editor: Ann Braybrooks. Engineer: George Charouhas. Art Director: Paul Wenzel. Voices: William Woodson (Narrator); Tress McNeille (Chip, Gadget, Mrs. Booby, Mrs. Clutchcoin); Corey Burton (Dale, Zipper); Jim Cummings (Monterey Jack, Mr. Dumpty, Ali Bimbo, Professor Nimnul); Nema Smith (Nog). Flush with the mammoth success of DuckTales, Walt Disney Television Animation gained a permanent berth in the Disney organization, with Michael Eisner (who initiated the enterprise) and Jeffrey Katzenberg (who had taken the reins of animation in general) giving it their support and focus. 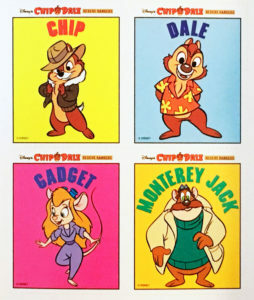 Rescue Rangers evolved from a variety of ideas, from a proposed TV version of The Rescuers to a then-timely concept called Miami Mice. The common theme was crime solving. A number of characters were bandied about, including an eagle, an ostrich and a chameleon who was a master of disguise. Monterey Jack was included, but he was not yet an Aussie. Eisner and Katzenberg began to toss around the idea of using well-known Disney characters in the lead roles. 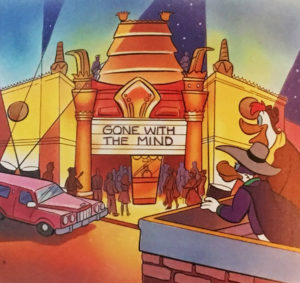 According to this recent oral history at syfy,com, it was decided that felt it was too soon to bring Mickey to regular series TV, Donald’s voice was an issue, but Goofy might have had possibilities as the head of a detective agency. In a recent conversation with story editor and former Disneyland Records producer Jymn Magon–who was working on pitches with writer/producer Tad Stones—recalled what happened. 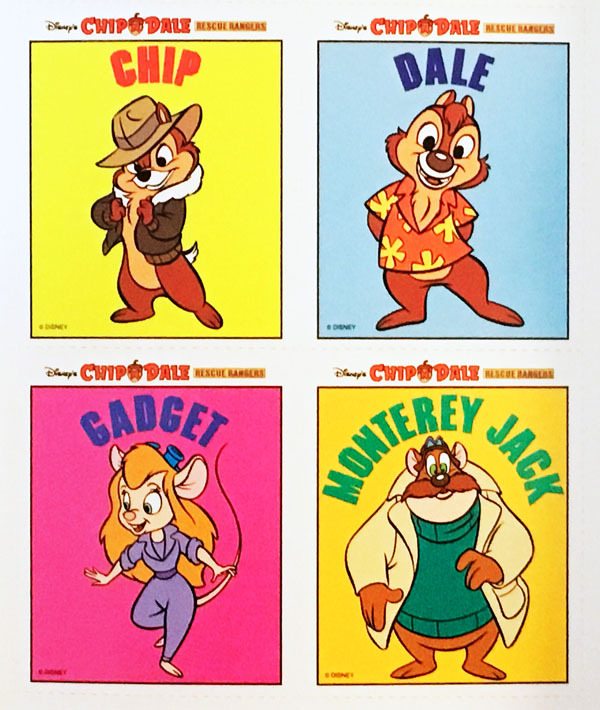 “I said, ‘Put in Chip and Dale and that’s what we ended up developing.” Gadget was inspired by Michelle Meyrink’s character in the movie Real Genius [Jordan]. We said, ‘We should have a character like that—she talks a mile a minute, doesn’t have a clue but is a mechanical genius.’ No one told us to give them a positive female role model, it just happened.” (Tremendously popular, Gadget inspired her own attraction, Gadget’s Go Coaster, at Mickey’s Toontown in Disneyland Park. 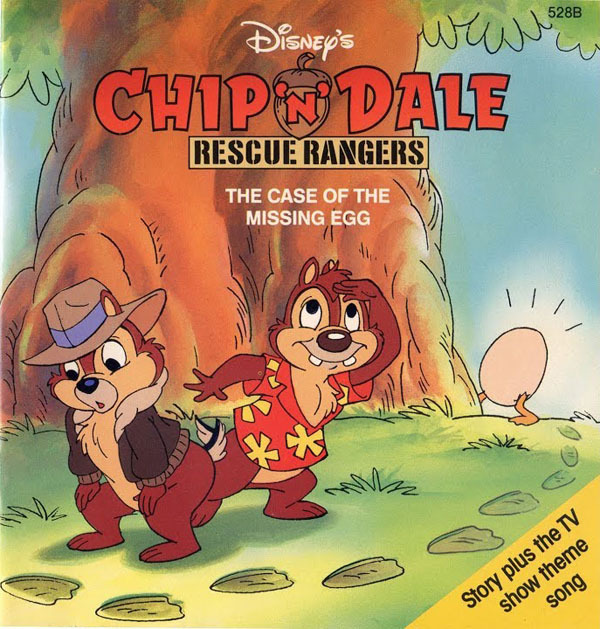 There are three total read-along book and cassette sets based on Chip ‘N’ Dale Rescue Rangers. (Disney had already phased out their little vinyl records and compact discs were yet to come.) The first two sets were based directly on two episodes and use dialogue from the soundtracks with stock music from the Walt Disney Records library. Released in 1991. Producer: George Charouhas. Writer: Paula Sigman-Lowery. Editorial: Ted Kryczko. Art Direction: Paul Wenzel. Illustrator: Running Time: 17 minutes. 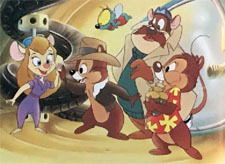 Voices: William Woodson (Narrator); Tress McNeille (Chip, Gadget); Corey Burton (Dale); Peter Cullen (Monterey Jack, 1988); Jim Cummings (Monterey Jack, 1991). 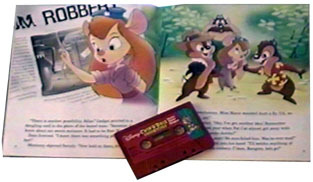 All of the read-alongs were reissued in sturdier clamshell blister packages (as opposed to the lighter bags of the past) with updated designs dominated by magenta colors and a large Disney brand insignia, to “family” with other Disney merchandise. 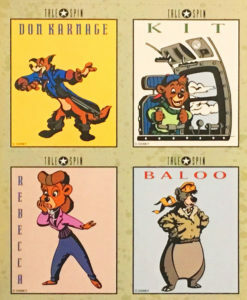 The newest Disney Afternoon titles were packaged with bonus trading cards “tip-ins” a subscription offer for Mickey Mouse Magazine on the back panel. Disney synergy was firing on all cylinders. 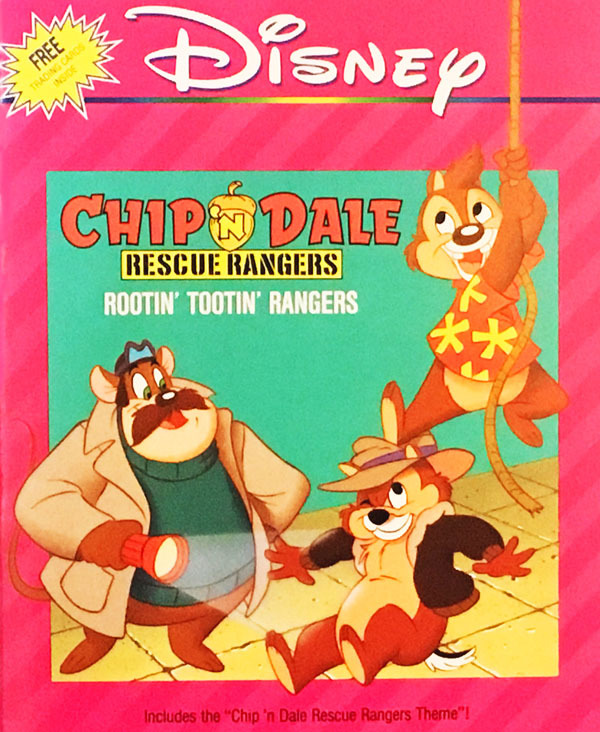 Unlike the other two Rescue Rangers titles, Rootin’ Tootin’ Rangers was not based on a TV episode, but was recorded especially for the read along by members of the original cast. It is particularly noteworthy because it was written by renowned Disney author/historian Paula Sigman-Lowery, who at the time was part of the Disney Character Voices department, specializing in the accurate recording, vocalization and verbiage of characters. (Look for Paula’s new essay in the recent book Practically Poppins in Every Way. Released in 1991. Producer: Randy Thornton. Writer: Jymn Magon. Editorial: Ted Kryczko. Engineer: Jeff Sheridan, Audiovisions. Art Direction: Paul Wenzel. Art by Playhouse Pictures. Running Time: 13 minutes. Released in 1991. Producer: Randy Thornton. Writer: Jymn Magon. Editorial: Ted Kryczko. Engineer: Jeff Sheridan, Audiovisions. Art Direction: Paul Wenzel. Art by Playhouse Pictures. Running Time: 14 minutes. 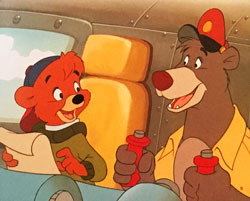 Voices: William Woodson (Narrator); Ed Gilbert (Baloo); Sally Struthers (Rebecca); R.J. Williams (Kit Cloudkicker); Jim Cummings (Louie, Don Karnage, McWhirtley); Pat Fraley (Wildcat); Tony Jay (Shere Khan); Tony Pope (Islander Chief, Pilot #1); Corey Burton (Panther Pilot, Pilot #2); Chuck McCann (Dumptruck, Band Leader). Talespin was born out of bare necessity, so to speak. The TV animation team had been pitching a number of ideas but to no avail. One was a reboot of Rocky and Bullwinkle. Disney’s Buena Vista Home Entertainment had great success with VHS releases of the classic Jay Ward cartoons, but the rights of course did not belong to Disney. The weirdest idea put Winnie the Pooh in New York City, which I like to call “That Pooh.” A third starred the “B-level” characters. At the same time, the two-hour Disney Afternoon block was about to be launched with DuckTales, Chip ‘N’ Dale Rescue Rangers and Disney’s Adventures of the Gummi Bears (which had such a long run on NBC it yielded enough episodes for syndication). A new series was needed as the hook, but time was running out. 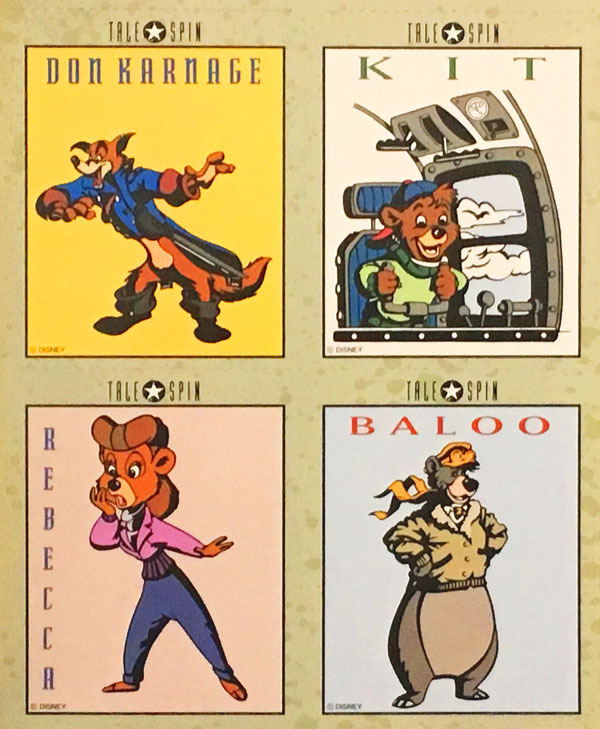 Besides The Jungle Book, Talespin gathered inspiration from TV’s Cheers and the movie classic, Casablanca. For All in the Family and Pebbles and Bamm-Bamm fans, it had Sally Struthers voicing Rebecca Cunningham. For Disney record buffs, this would also mark Sally Struthers’ first work especially for the label. The legendary Chuck McCann had appeared on Disneyland Records’ Official Album of Epcot Center as in the role of Dreamfinder in the Journey to Imagination attraction, but it was an existing Walt Disney Imagineering soundtrack. This would also be the first recording he made specifically for the Walt Disney Records. Here’s a delightful aspect to these two books: the art was created at Playhouse Pictures, the plucky little studio where Bill Melendez directed the first Peanuts animation for Ford commercials, the wonderful Night Before Christmas special was produced and a lot more. Released in 1991. Producer: Randy Thornton. Writer: Jymn Magon. Editorial: Ted Kryczko. Engineer: Jeff Sheridan, Audiovisions. Sound Editor: Leslie McGuire. Art Direction: Skip Morgan. Art by Geppi Vaccaro & Associates. Running Time: 11 minutes. Voices: William Woodson (Narrator); Jim Cummings (Darkwing Duck/Drake Mallard); Christine Cavanaugh (Gosalyn); Terence McGovern (Launchpad); Linda Gary (J.D. Rockefeather, Frequencia). Each year, The Disney Afternoon would premiere one new series and drop one. For season two, Gummi Bears bounced away and Darkwing Duck premiered to much acclaim and rabid fandom. The series went even further into the realm of the bizarre than Chip ‘N’ Dale Rescue Rangers with a gallery of twisted, transformed characters, but grounded with the Disney heart of home life and relationship provided by little Gosalyn. 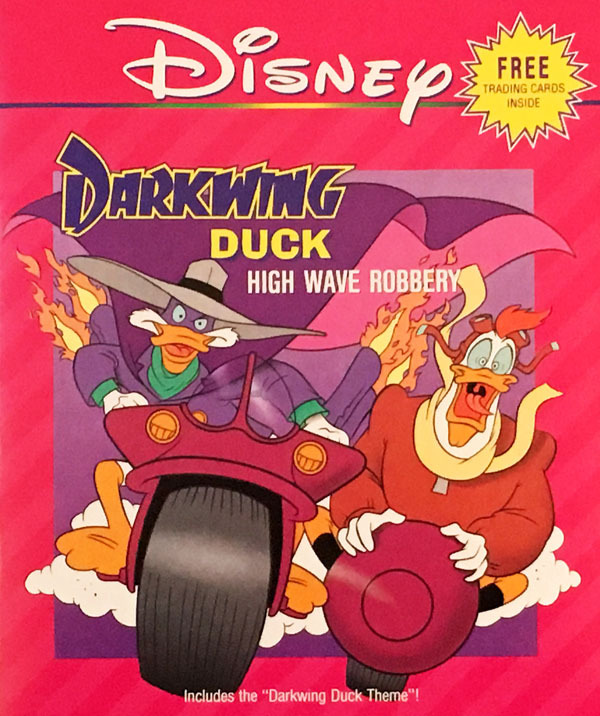 There was only one Darkwing Duck read-along set. By 1991, the market for children’s audio was awash in competition. Home video had more than gained momentum—there were many Disney Afternoon titles—as well as major Disney classics–on VHS. Video games were highly sophisticated. Today, it’s remarkable that read-along products still even exist, but fortunately they still do. Now handled by Disney’s publishing division, they are still recorded and produced by Walt Disney Records. Small correction, Cullen did not voice Monterey on any of the records, the other two had Jim Cummings credited in the book itself. Thanks for pointing that out, Mathieu. Very few if any read alongs in that format ever had credits and sure enough, there they were! Appreciate the care and attention. 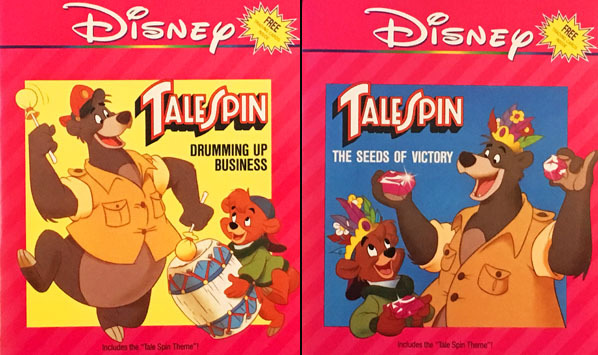 I remember “Tale Spin” running on The Disney Channel — then a premium cable option like HBO — before coming to broadcast TV as part of the Disney Afternoon. If that was always the plan, it would have pushed the production of the show (or at least a batch of episodes) even earlier. Also recall seeing a Disney annual report with promotional art for the upcoming “Tale Spin”. It showed a taller, more sophisticated-looking Rebecca. Was she redesigned to fit Struthers’s voice, or was Struthers cast after the character had been revised? “To the best of my memory, we were told to make Tale Spin for the syndicated Disney Afternoon package. If it showed on the Disney Channel (or elsewhere), it may have only been for some unique promotion. We were basically scrambling to get the ‘Plunder and Lightning’ promotional movie ready for its syndication premiere. I seriously don’t think any episodes showed up on premium channels. Tale Spin definitely premiered on the Disney Channel the winter before it was released into syndication (this was also true of Rescue Rangers, Darkwing, New Adventures of Winnie the Pooh, Goof Troop, Bonkers, and the Aladdin series. I remember “I Only Have Ice for You” was the first episode shown. 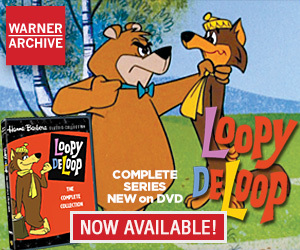 All these series ran for a few months, disappeared from the channel without fanfare, and then reappeared the fall in syndication (and/or ABC in the case of Pooh, Darkwing, and Goof Troop). The pilots were never shown on the Disney Channel, and it was a little jarring figuring out new characters and relationships. Shame these all are for wee babies.